Terrell Bynum is finally building momentum. Take that unfortunate morning in February, for example. Bynum — a 6-foot-1, 198-pound redshirt sophomore wide receiver — woke and embarked on the menacing, snowy drive to an early workout. The Long Beach, Calif., native inched down the notoriously steep hill on Northeast 45th Street near campus. At least, it started as an inch. It wasn’t terrible, for one thing, because the damage wasn’t too devastating. But that wasn’t the only reason. “I saw people going like 5 mph,” Bynum explained. “I was like, ‘Wow, I’ve got to make it to workouts.’ I actually made it on time. In the car, and out of it, Bynum is starting to gain some speed. The former 247Sports three-star recruit redshirted his freshman season in 2017 and then underwent hand surgery to repair a right thumb injury in January 2018. He failed to secure a single catch in his first two full seasons on campus, despite appearing in 10 games last season. Why, then, has he suddenly started to surge? This time last spring, Bynum described his temperament as “a little timid. I wasn’t really talking much. I was kind of just laying low, staying behind.” But as his confidence has come, the catches have accrued. 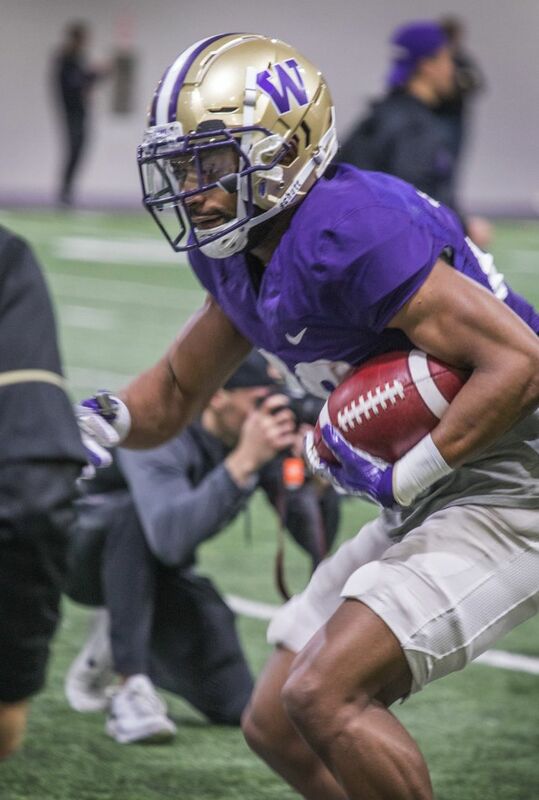 The former St. John Bosco standout produced perhaps the biggest offensive highlight in the Huskies’ first five practices last Friday, sprinting past cornerback Keith Taylor and snagging a rainbow in stride from junior quarterback Jacob Eason for an untouched touchdown. He later boxed out redshirt freshman cornerback Kyler Gordon and high-pointed a jump ball for another massive gain. Bynum also impressed at last month’s Husky Combine, finishing fourth on the team with a 4.48-second 40-yard dash. The goal now is to prove Friday’s practice wasn’t a fluke. While returning wide receivers Aaron Fuller, Ty Jones and Quinten Pounds have been sidelined due to injuries this spring, Bynum’s athleticism has been on display. He’s making the most of his starting reps.
He’s ascending, and he isn’t surprised. “I’ve always felt (it was my time),” Bynum said. “This year has probably been the most I’ve ever grinded, so there was going to be an opportunity regardless of if (the injured wide receivers) were there or not. Can Joe Tryon help improve the Huskies' 'pitiful' pass rush this fall? Despite the delay, Bynum is definitely dangerous. And, according to offensive coordinator Bush Hamdan, his case isn’t all that uncommon. Of course, first-year UW wide receivers coach Junior Adams has also played a part in that — and not just for Bynum. “(Former wide receivers coach Matt) Lubick was awesome, but coach Junior Adams is just a different energy,” Bynum said. “He riles us up, gets us going, makes it a lot more fun atmosphere. So far this spring, Bynum hasn’t needed to talk stuff. His tape has done the talking. But that tape is still limited; it lacks so much as a regular season catch. When August arrives, he’ll have to fend off Fuller, Jones, senior Andre Baccellia, several redshirt freshmen and highly touted signee Puka Nacua for opportunities. He’ll have to keep proving himself. He’ll have to keep building momentum … and hopefully it won’t be too terrible.